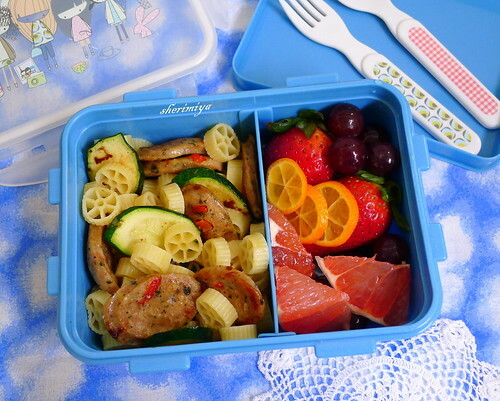 Daytrippers Pasta Bento, a photo by sherimiya ♥ on Flickr. It's a lovely bento, and that fact that TinySprite loves it even without any cute details, only proves how yummy the contents is. I never heard of mandarinquats before. They look nice, how do they taste? I wouldn't need any cute to go with that one either. Gorgeous! The pasta looks amazing, what kind of chicken sausage do you buy? there's something especially cute about kumquats (or in this case mandarinquats), no fancy cutting or accessories necessary to cute-ify them! love how they echo the shape of the wagon-wheel pasta, too. and the sausage and zucchini combo is a winning one, yummm! Thanks Lia, Nichole, Ceinwyn, Heather, Aarthi, megan and karaimame! Ceinwyn, mandarinquats taste like kumquats to me; they are a hybrid of mandarins and kumquats. Maybe a little sweeter. Heather, I buy either the Trader Joe's brand or the Safeway Nature's brand.